The holidays are upon us and we're working with the MOON group for our holiday gift guide. I hope you find something useful with all the items available. Lots of time was put into the making of the guide. Feel free to leave comments if you find new items you like. Thanks. 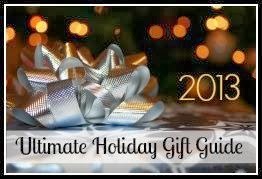 **The above Holiday Gift Guide could not have been made possibly without the team over at Recommonk. I want to thank them for creating such a wonderful program and for putting up all requests and changes submitted by Randi from Make Our Own Network! Jewelry and perfume. Would love to win this gift card.